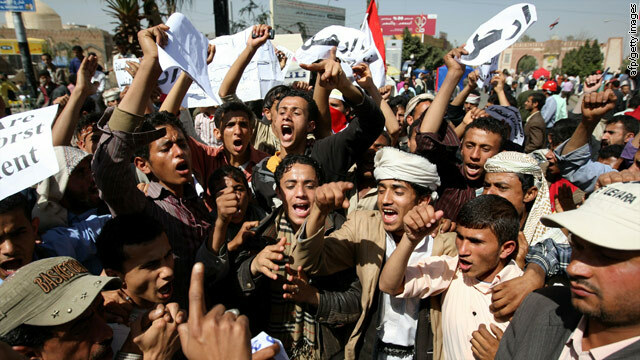 Anti-government demonstrators in Sanaa, Yemen, on Monday. Across the Middle East and North Africa, CNN's reporters and iReporters are covering protests, many of them inspired by revolts in Tunisia and Egypt that toppled those countries' longtime rulers. Check out our story explaining the roots of the unrest in each country. Have a story to tell from the scene? Click here to send an iReport. LIBYA 11:45 p.m. ET, 6:45 a.m. local: U.N. Secretary-General Ban Ki-moon has called on Libya to immediately stop the "unacceptable" attacks on anti-government demonstrators. unacceptable. This must stop immediately. This is a serious violation of international humanitarian law." LIBYA, 11:22 p.m. ET, 6:22 a.m. local: At the request of Libya's deputy ambassador to the United Nations - who earlier today called the crackdown in Libya a "genocide" - the U.N. Security Council scheduled a Tuesday morning meeting on Libya. This will be the first time the council has held consultations over any of the revolts that have swept Arab nations since January. BAHRAIN, 8:51 p.m. ET, 4:51 a.m. local: CNN's Tim Lister reports from Bahrain, where he walked among protesters in the capital's Pearl Roundabout. Thousands of demonstrators were in the roundabout on Monday, preparing for a massive demonstration on Tuesday. Lister says the demonstrators' encampment has taken on an air of permanence, with tents, makeshift kitchens, even a rudimentary field hospital. LIBYA, 7:40 p.m. ET, 2:40 a.m. local: About 15,000 of Libya's 2 million to 3 million Egyptians returned Monday across the border, border officials said. and I want to stay the night with them but then it started raining. I want to show them that I am in Tripoli, not in Venezuela. Don't believe those dogs in the media." Green Square is where pro-government demonstrators in Tripoli have been located. Earlier today, British Foreign Secretary William Hague told Reuters that Libyan leader Gadhafi may have been on his way to Venezuela. LIBYA, 6:46 p.m. ET, 1:46 a.m. local: CNN's Cairo bureau chief Ben Wedeman has entered eastern Libya and is the first western television reporter to enter and report from inside Libya during the current crisis. He says much of eastern Libya appears to be in opposition control. "What we saw as we were driving in is that this part of eastern Libya is clearly under the controls of the rebels - the forces that are opposed to Col. Gadhafi," Wedeman by phone on CNN's "The Situation Room." "We saw along the road a lot of groups of men with shotguns - with machine guns - in civilian clothing. They call themselves basically the popular committees that are trying to maintain some sort of order along the way. "Clearly the situation is very unstable. What we saw was that there are a lot of people – mostly Egyptians – who are leaving Libya at the moment. At the Egyptian border we were told by Egyptian officials that 15,000 Egyptian s left Libya, returning to Egypt." "There are some signs of normal life. Gas stations are open. Stores are open. We saw … what looked like kebab shops that are functioning. There is a fair amount of traffic on the road, although I was told that was mostly Egyptians leaving the country." LIBYA, 6:28 p.m. ET, 1:28 a.m. local: Ali Al Oujli, Libya's ambassador to the United States, said earlier today that he urges protesters in Libya "to keep momentum alive." "If they they keep the momentum in the Libyan streets, (then) they’ll reach their goals. ... They have a very good experience on what happening in Egypt and what happening in Tunisia. And they should not compromise." LIBYA, 6:22 p.m. ET, 1:22 a.m. local: Earlier today, this blog reported that Ibrahim Dabbashi, Libya's deputy ambassador to the United Nations, told reporters Monday that Libyan leader Moammar Gadhafi has declared war on the Libyan people and is committing genocide. Below is video of those comments. Dabbashi was speaking in reference to reports that the Libyan military was firing on protesters. LIBYA, 6:07 p.m. ET, 1:07 a.m. local: A formerly pro-government newspaper in Libya is reporting that African mercenaries are shooting at unarmed civilians in Tajouraa, 25 miles east of Tripoli. The newspaper Quryna's perspective has changed since protests in Libya began. LIBYA, 5:32 p.m. ET, 12:32 a.m. local: The United States on Monday condemned the violence in Libya and called for a halt to the "unacceptable bloodshed" in response to civil unrest, Secretary of State Hillary Clinton said in a statement. "The government of Libya has a responsibility to respect the universal rights of the people, including the right to free expression and assembly," Clinton's statement said. Earlier, a U.S. official not authorized to speak publicly told CNN that Libya has used "aviation assets" to attack protesters on the outskirts of Tripoli. In the following video, CNN's Ivan Watson, reporting from Egypt, talks about these allegations that Libya used aviation assets to attack protesters. LIBYA, 5:21 p.m. ET, 12:21 a.m. local: Libya has used "aviation assets" to attack protesters on the outskirts of Tripoli, a U.S. official not authorized to speak publicly told CNN Monday. The official could not be more specific about the "assets," but the National Front for the Salvation of Libya, an opposition group, said helicopter gunships have fired into crowds of protesters. Read this post for more information and to see the video. LIBYA, 4:31 p.m. ET, 11:31 p.m. local: A woman in Tripoli, speaking on condition of anonymity, reports seeing people shooting - in an apparently random fashion - from cars. "I've seen myself red Hyundai cars with tinted windows that had armed people inside it shooting random people," she told CNN in a telephone interview. "Three victims have fallen in the street where I live." LIBYA, 4:01 p.m. ET, 11:01 p.m. local: The Arab League will hold an urgent summit Tuesday to discuss the recent developments in Libya, Egypt's official news agency MENA reported Monday. ZIMBABWE, 3:53 p.m. ET: Zimbabwe isn't part of either North Africa or the Middle East, but a recent development there has links to the North African/Middle Eastern unrest. Police in Zimbabwe have arrested dozens of political activists and trade union members on suspicion of plotting an Egyptian-style uprising in the southern African country. BAHRAIN, 3:43 p.m. ET, 11:43 p.m. local: Mass protests planned in Bahrain for Tuesday in support of calls for political reforms coincide with the planned return of Hassan Mushaimaa, who is the leader of Bahrain's largest opposition party, the Haq Movement. Thousands more people moved into Bahrain's Pearl Roundabout on Monday ahead of Tuesday's planned mass demonstrations. Meanwhile, fallout from last week's violent protests continues. A 20-year-old protester in Bahrain, who was shot in the head on Friday, has died, hospital sources said Monday. SUDAN, 3:24 p.m. ET, 11:24 p.m. local: Sudanese President Omar al-Bashir says he will not run for re-election four years from now, a senior member of the country's ruling National Congress Party announced Monday. "He will also leave his post as chair of the NCP to allow for the transformation of power to a new generation," said Rabi Abd al-Ati. The senior NCP member rejected the notion that al-Bashir's decision was prompted by popular uprisings in the region, including neighboring Egypt. LIBYA, 2:15 p.m. ET, 9:15 p.m. local: Two Libyan Air Force pilots defected to Malta on Monday after being asked to bomb Libyan citizens, a Maltese government source said. The pilots' fighter jets were armed with rockets and loaded machine guns, the source said. Malta is a short flight from Libya. LIBYA, 2:04 p.m. ET, 11:04 p.m. local: Libyan Prime Minister Baghdadi Mahmudi met in Tripoli with ambassadors of the European Union, blaming the unrest in the country on "terrorists and destructive plans" and stressing that Libya has the right to "take any measures" to protect its unity, stability, people and resources, Libyan state television reported. LIBYA, 12:26 p.m. ET, 7:26 p.m. local: Ibrahim Dabbashi, Libya's deputy ambassador to the United Nations, told reporters that Libyan leader Moammar Gadhafi has declared war on the Libyan people and is committing genocide. Who is Gadhafi? YEMEN, 12:17 p.m. ET, 8:17 p.m. local: Two human rights organizations, including Human Rights Watch, are reporting that 12 people have died as a result of protests in Yemen. LIBYA, 12:02 ET, 7:02 p.m. local: British Foreign Secretary William Hague told Reuters that Libyan leader Moammar Gadhafi may be on his way to Venezuela. CNN has not confirmed. Gadhafi has maintained power in the country for 42 years. The Libyan ambassador to the UK, Omar Jelban, is denying that Gadhafi is on his way to Venezuela. Google has designed this map of protests based on what it calls "reliable tweets." Personal up-to-the-minute audio reports have been uploaded on Google here. CNN has not yet vetted these reports. LIBYA, 11:45 a.m. ET, 6:45 p.m. local The government is demanding that citizens cooperate with security forces, and warning "organized gangs," Libyan state television reported, as security forces conduct raids on what it called "nests of terror and sabotage." Libya's justice minister, Mustafa Abdul Jalil, has resigned to protest the "bloody situation and use of excessive force" against protesters by security forces, a Libyan newspaper reported. Meanwhile, two Libyan fighter jets have landed in Malta, according to journalists at the airport. YEMEN, 11 a.m. ET, 7 p.m. local: It is the 11th day of protests. More than 3,500 gathered in the capital Sanaa for a peaceful demonstration, but violence broke out in Aden as police fired on demonstrators. CNN's Mohammed Jamjoom reports what the Yemeni government doesn't want anyone to see. Journalists were not allowed entry into hospitals where wounded students were taken, and Jamjoom shows you how difficult it is for reporters to get the truth about what youths have been calling their movement. Yemeni President Ali Abdullah Saleh refuses to step down and compared anti-government protests in his country to the flu spreading through the region. "This is a virus and is not part of our heritage or the culture of the Yemeni people," he told reporters. LIBYA, 11 a.m. ET, 6 p.m. local: As reports streamed of protesters setting fire to a government building in Libya's capital and ransacking state TV headquarters, questions swirled around Gadhafi and whether he could be the third Arab leader toppled by the wave of protests rippling through the region. His son, Saif al-Islam Gadhafi, is trying to defend the family dynasty, warning on state television of "a fierce civil war" if the demonstrations don't halt. Who is the Western educated son of Gadhafi? What could Libya's uprising mean in the long term, CNN commentator Kirk Vandewalle asks. He wrote "A History of Modern Libya." IRAQ - Unlike other nations, protests here have not targeted the government. Demonstrators are enraged by corruption, the quality of basic services and high unemployment. Most recently, on Sunday, A 17-year-old boy died and 39 people were injured were injured as demonstrators battled Kurdish security forces in Sulaimaniya in northern Iraq, officials said. CNN's Reza Sayah reports from Islamabad, Pakistan, on the violence. Masked gunmen attacked and burned an independent television station in Iraq's Kurdistan region Sunday, wounding a guard, police officials and the broadcast company said. ALGERIA - Protests began in January over escalating food prices, high rates of unemployment and housing issues, and iReporters were there. Rallies started in Algiers, but spread to other cities as more people joined. Algerian President Abdelaziz Bouteflika announced that he would lift the state of emergency law in what analysts said was an attempt to head off a similar revolt. DJIBOUTI - Protesters in Djibouti are angry about the economy. The country is home to Camp Lemonnier, the only U.S. military base on the African continent. Protesters have called for President Ismail Omar Guelleh - whose family has ruled the country since its independence from France in 1977 - to step down ahead of the elections scheduled in April. JORDAN - Jordan's economy is struggling as commodity prices rise and youth unemployment is high, as it is in Egypt. Its king has called for swift reform. KUWAIT - Protests are relatively new, beginning over the weekend. Demonstrators, who want greater rights for longtime residents who are not citizens, attacked security forces late last week. SUDAN - Protesters are demanding an end to National Congress Party rule and government-imposed price increases. A "Day of Rage" was reportedly organized on Facebook against the government, but it failed to materialize. Human Rights Watch says authorities used "excessive force" during largely peaceful protests on January 30 and 31 in Khartoum and other northern cities. Witnesses said that several people were arrested, including 20 who remain missing. TUNISIA - An uprising in Tunisia prompted autocratic President Zine El Abidine Ben Ali to leave the country on January 14, after weeks of demonstrations. Those demonstrations sparked protests around North Africa and the Middle East. PALESTINIAN TERRITORIES - Hundreds of Palestinians rallied for unity in Ramallah, calling on Hamas, Fatah and other Palestinian political factions to heal their rifts amid arguments over elections scheduled for September in the Palestinian territories. "Division generates corruption," was one of several slogans written on banners held up by the demonstrators Thursday, who flooded the streets after calls went out on social networking sites, as well as schools and university campuses, for them to attend. SYRIA - As protests heated up around the region, the Syrian government pulled back from a plan to withdraw some subsidies that keep the cost of living down in the country. President Bashar al-Assad also gave a rare interview to Western media, telling The Wall Street Journal last month that he planned reforms that would allow local elections and included a new media law and more power for private organizations. Too bad those defecting MIG pilots didn't bomb Gaddafi to hell instead of fleeing to Italy. They would have been real heros, then. I pray Americans will be able to leave safely from Libya. I am utterly gutted that this is being allowed to happen. I cannot reach my family via cell phone, email, landline or anything else, and yet the powers that be stand back and let this genocide happen. I will not forget my family, nor will I forget that, help that could have been given was not!!!! The Brits (And I am one) and the US have all taken back handers from this monster, and now they will sit back and do nothing? Well I tell you this, we don't forget, and for those that think it's ok to sit back and do nothing, just remember when it's your turn to need help! ut then again, I would never turn my back on those who needed me, because where I come from? That's called cowardice. Thanks Anderson for your courage Please with bended Knee help us bring the Cameroon Dictator of almost 30yrs to his knees. use my email address if u can please!!! Unfortunately I am a human being of facts and the fact is we are all about oil. The everyday person in America is about oil whether they know it or not. We have to get to work, class, store, and most importantly the gas station. Otherwise the others don't exist. This doesn't mean that we should let khadafi or ghaddafy or ghadaffy or whatever his name is get away with what he's doing. The people there know better than i think any of us know;especially our president. I heard tonight that our options are wide open except that we don't know what option to utilize right now. Bhedalzi and Tripoli are at a stalemate just as the world and Lybia are at a stalemete. Citizens in tripoli have stated that it seems that khadafi may be winning right now but thats because bhedalzi and tripoli are like california and utah except to us its like california and new york. They are so far away that the mileage between them don't matter. Let's sit back and wait to be called on for once. I do think when countries call for democracy they think of AMERICA. Call me foolish but we are still the land of dreams and the place people think of abroad. Our problem is we don't know how good we got it because everything has become so damn relative. One day I hope we all get our own wake up call and see how beautiful this place really is behind a different perspective. Americans should stop their influence on innocent people i pray Qaddafi doesn't strike if he does America is going to be like Haiti .Qaddafi is not leaving today or tomorrow this is Africa because they only need a head for war but he need a head for everything.Qaddafi is the best man for Libya. America should sacrifice our guys because we need oil more than the rest. We have an addiction at resources all over the world. We are no stupid. We know why we fighting and if we make lies about Gaddafi, we have good reason. Thanks to george orwell 1984. We as Citizens of the United States and those who are elected by the people to lead it, should look at OUR OWN HISTORY and start by asking our selfs. Could we have become the Nation we are today, the Democracy, the Symbol of Freedom known throught the World as a LEADER without help? The Answer to that question I will leave up to you. But without the FRENCH, I strongly agree America would be alot less independent. The United States of America is letting down every Democratic Libyan by not being the ones on the phone every day convincing the UN councle to establish the NO FLY ZONE. Because when the Libyan Rebelian falls to Gadafi it will be the United States of America folks who will be the Bad GUY. Not Standing up for a Democratic Ally is the same as watching some one you know get the crap beat out of them and just watching it happen making you guilty by association. THE BAD GUY. I just hope we have only missed the first play and not the Game by waiting this long. america should explore and drill their own oil. they should not buy oil from middleeast countries.nor invade or engage in war because of oil.